The role of RAF Typhoon Display Pilot is reserved for those lucky few who get to spend a display season engaging with the public and demonstrating the capability of the RAF's premier front-line combat aircraft on the world stage. This year the honour falls to Flt Lt Jim Peterson who will provide his own take on this flagship display. Of course, there is much more to the man, and the display, than what we see at an airshow or in the skies above RAF Coningsby – all of which helps make the 2018 display unique. Couple that with RAF100 and the pressure to perform a worthy spectacle for this year is significant. During a recent visit to RAF Coningsby, Andy Evans spent some time with Flt Lt Peterson getting to know him and getting a feel for what the airshow-going public can expect during the 2018 display season. Photography by the author and the UKAR Staff Team and James Peebles. Moving from Bermuda to West Sussex in 1981 aged 4, Jim's first experience of an airshow occurred at Bournemouth aged 10 which stirred a life-long fascination with aviation that has ultimately resulted in a flying career reaching its current pinnacle, but why did he choose the RAF? It was a job I really wanted from being a kid. I always wanted to be a pilot and joining the RAF came about through the air cadets - I thought I'd be an airline pilot so joined the Air Cadets and then I saw what the RAF had to offer. So I thought, "why don't I go and do that?" I get to be an airline pilot later in life and here I am now, aged 40, still in the RAF. The Air Cadets clearly had a significant influence on Jim's decision to join the RAF but how did it help him on his journey to becoming the 2018 Typhoon display pilot? It was brilliant actually, I got there aged 13 and within a year or so I was flying a Chipmunk and then they took me gliding. Once every year or so I'd go flying in something which kept my interest up. They also let me go solo in gliders when I was 16 and I then got a sixth form scholarship with their help, so I had 20 hours flying when I was 17. The following year I was sponsored to go to university by the Air Force. It was all helped and brought forward by the Air Cadets. 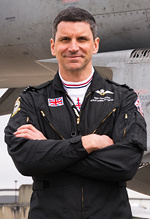 After completing his flight training in 2003 Flt Lt Peterson was posted on to the Tornado GR.4 and, after the OCU, he joined XIII Squadron at RAF Marham. During this posting he was able to complete the NATO Tactical Leadership Program and flew combat operations over Iraq on two separate deployments. Taking the leap to Typhoon in 2006, Jim became a ground school and simulator instructor at RAF Coningsby prior to joining a Typhoon front line unit in the form of XI(F) Squadron in 2009 where, in just three short years, he provided Quick Reaction Alert both at RAF Coningsby and in the Falkland Islands; he also flew the Typhoon in combat over Libya. It is little surprise, therefore, that Jim believes taking an aircraft into combat are key moments that will stick with him. 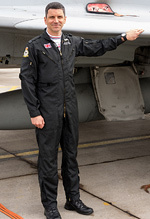 Prior to returning to 29 Squadron in 2015, Peterson was posted in 2012 to 17(R) Squadron/41(R) Squadron as an Evaluator Pilot specialising in Electronic Warfare; an aspect of flying the Typhoon he now teaches students at RAF Coningsby. Jim is therefore well placed to comment on how the Typhoon compares to the much-loved Tornado and what the future holds for them. The Typhoon is just next generation compared to the Tornado. The Tornado still is a very capable aircraft but the thing is it was never designed to be a multi-role aircraft, it was always designed to be a low-level bomber which it was fantastic at. Now, due to how warfare has changed subtly it now finds itself at medium-level doing the air-to-surface and reconnaissance where it's brilliant but the engines and airframe are not designed to be up there. It can't go as high as a Typhoon or go as fast as a Typhoon necessarily. 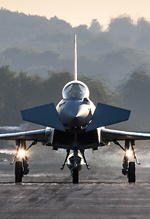 The thing about a Typhoon is that it can effectively be a Tornado F.3 and GR.4 all in one jet because the Typhoon is carrying four Paveway IV, four AMRAAM plus two ASRAAM on all one airframe, whereas that would be one, maybe two GR.4 and one F.3 to have that all in one place. 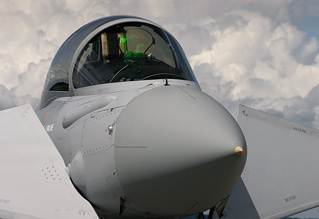 The Tornado typically carries more fuel that the Typhoon thanks to its 2,250l external tanks compared to the Typhoon's 1000l however due to the lower overall weight of the aircraft, the Typhoon is more capable at higher altitudes especially when supported by aerial refuelling assets. What I have seen on operations in Iraq and Libya is that we still have good endurance, we can hang around at 40,000ft and Mach 0.9 burning around 40 kilos a minute which is remarkable. Once the Typhoon's got the Storm Shadow it is the RAF's plan that that is when the Tornado will finally be retired. Being a display pilot was something Jim had always wanted to do, giving something back to the airshows whilst increasing his experience through performing routines and engaging the public for a year. 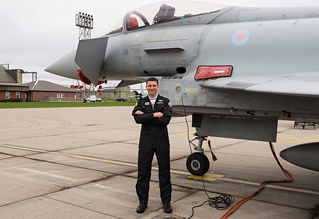 He admits that this is just one year in a long RAF career but it was certainly on his bucket list. That said, his emotion on being chosen to be the RAF100 Typhoon Display pilot was clear. The process of selection as display pilot however, isn't as straight forward as filling in a form and attending an interview as many may think. Fantastic. It was all my dreams come true really. I've really set myself up over the past few years to get this job, I pinned all my hopes on it and was chuffed to bits to get it. I had to be an instructor on 29 Sqn; now that's the only position within the RAF where you can become the Typhoon display pilot. I had to do my time on the squadron, so I have been here for two, two and a half years now so I have been able to establish myself as an instructor on the squadron. As a result, I have been able to watch the display pilot from last year and the year before going about their business. I formally applied in September, following which we had an interview process and a simulator test where we had to fly Ryan's display  in the simulator twice; they critiqued how well we flew it and then the decision was made in October. Jim began his display design shortly after being chosen as the display pilot with a clear idea of what he wanted to do. However, he is limited to what he can perform and has taken into account the views of people from social media. There are only so many manoeuvres we are allowed to do, and they are written in a book. Trying to create your own unique display is slightly tricky but I took a lot of advice from last year's display pilot and also checked a bit of feedback out on Twitter as to what the photographers like to see. There are a lot of requests saying that a top-side pass is something they like so I've tried to do that, as well as a lot of people saying they wanted the display to be low, loud and fast. The thing with the Typhoon is that it is a bit more than the old school Tornado display - 100ft, fast, turn around and repeat - which everyone loves. I think Typhoon offers a bit more so I've tried to put in three passes at 100ft at high speed just because it is a spectacle to see but I've also tried to mix it up with some slow passes and some looping. With its carefree handling the Typhoon tends to skid around the sky so I've tried to incorporate this particular unique manoeuvre into the display which you will see! As with any military flying display team there are specific stages that have to be gone through prior to achieving Public Display Authority (PDA). In the case of the Typhoon, Flt Lt Peterson first created his own display sequence from the list of allowed manoeuvres in the book and then flew the display in the simulator prior to Christmas to confirm that it worked. After Christmas, he began initially practising at 5,000ft which gave him an idea of the G tolerances. Once we had done those we then went to the force commander and said that we had done these six displays and this is what we want to do. We need his blessing to go below 5,000ft because once you're below 5,000ft you're breaking any normal RAF fast jet rule. Anyone is allowed to do aerobatics above 5,000ft but to do it below you need special dispensation. Last year there was a lot of in your face down the B axis around datum so I thought to make it a little bit different for this year was to probably do a bit more down the A, a bit more left to right. That's where I've kind of focussed my workup and design. You're never quite sure how the jet will react to your manoeuvres. Certain manoeuvres depending on where they are in the sequence depends on what the fuel weight of the aircraft is and there is a couple I do at quite high speed. My four-point roll down the A I am doing at 500kts so the forces on the rudder are quite extreme for that. Also, the fuel burn as I am in reheat a lot, you never quite know how the jet will react to that kind of fuel consumption so we have had a couple of engineering queries along the way but nothing that hasn't been within the capabilities of the aircraft. It's very exacting on your body is how I would describe it. The first few times you go you're a bit wobbly when you come out of the aircraft because your senses have been completely bamboozled from the high G, the fact you're at 9G for most of 7 to 8 minutes just makes your body wonder what has been going on. Like with anything, you start off slowly, you build yourself up and the more you do it, the better you get at it and more used to it. Now I'm content with the more physical aspects of it, it's a completely new set of rules you need to adhere to and a completely new mindset really. I'm absolutely loving it at the moment, it's really good fun. 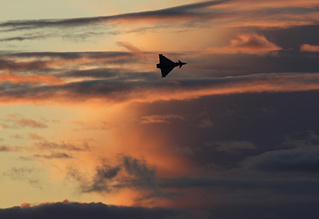 A comment that often appears on the UKAR forums, among others, is that the RAF Typhoon display of recent years hasn't appeared as aggressive as its European counterparts, especially the French Air Force Rafale. Is it the book of allowed manoeuvres that prevents this? No, not at all, it's down to the pilot designing that sort of display. I've tried to keep it fast this year, as aggressive as I'd like the Typhoon to look but also without it looking like I'm not in control of the aircraft. Very assured, dynamic but channelled aggression if you know what I mean. Safety has to be number one, but it doesn't mean you can't have an awesome spectacle. To that end, why don't we see the RAF following the trend for European airshows and utilise smokewinders or flares as part of the display where possible? It is not the priority for the Typhoon as it develops to put smokewinders on. With regards to flares, at the moment we're keeping those for operations only. We are due to get a new flare suite in the future though so who knows what may happen in the future? Despite the Typhoon being equipped with a drag parachute for braking on the runway, the display doesn't include the use of it at displays where the aircraft lands, unlike many other fast jet displays. It's purely that it is not a routine stopping aid, it's more an emergency stopping aid for us. Once you've used the parachute, you have got to re-pack it then put it back in. We never use it as part of a display as it is an engineering burden, as well as the fact that it's not very often that we land where we display. 2017 saw both the Typhoon and Red Arrows fly an "alternate display axis" at a few shows in the country in the name of safety while comparable displays, some from other military air arms, displayed normally at the same airshows. 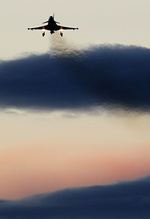 This prompted much criticism from enthusiast circles that the RAF had become far too risk averse and that this heralded the end of RAF involvement in airshows. Would this return for the 2018 season? Safety is how you interpret the rules and some people last year may have interpreted the rules differently to us. Last year as a team we thought that was the safest thing to do whereas this year we have taken all the feedback and re-evaluated. Cosford we plan to go back to the normal display axis but we do need to be mindful of Albrighton and the new rules since the Shoreham disaster. You might see an ever so slightly modified display from me at Cosford but the plan is to still use the normal axis. Duxford again, you have Duxford village which – because my show this year is more geared to the A axis, it does give me a bit more flexibility with regards to how I bend around certain places. The plan is to not have any alternative axis this year. The year's single biggest theme is the 100th anniversary of the forming of the RAF, a significant historical milestone which, quite rightly, should be celebrated and marked as extravagantly as possible. 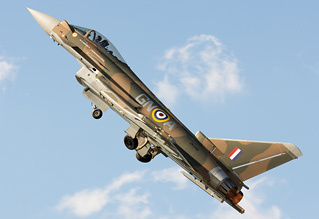 As the RAF fleet, and the display aircraft, are receiving a corporate logo seemingly in lieu of any commemorative paint schemes there has been some level of concern and dismay from the enthusiast community. Seeking clarification on the intentions of the RAF Typhoon Display team to display a specially schemed aircraft for RAF100, would we see a return of a "GiNA" type scheme or is the RAF100 logo jet the display jet for 2018? The RAF100 logo was specifically selected to match every aircraft type in service that will be taking part in the amazing flypasts planned throughout the Summer. The plan is for all the jets to commemorate RAF100 in the same way so we have all been given the same style logo to put on our aircraft. I think we have to remember is that RAF100 is bigger than just the Typhoon display team, and this year in particular, it would be inappropriate to be the odd one out. What we have ended up with is an Air Force-wide design which, when you see every single RAF aircraft with identical commemorative branding it will give a good impression I think. Would we be seeing something similar from the Typhoon this year akin to the Spitfire synchro of a few years ago? There is not going to be a dedicated Typhoon/Spitfire synchro display because the Typhoon Force is dedicating significant resource towards the RAF 100 celebrations in other ways. Just look to the skies on 10 July and you'll see what I mean. There is always the possibility that there will be mixed flypasts performed at certain events but nothing has been discussed in detail as of yet. Despite how visible the Typhoon display will be as part of the RAF100 celebrations, it may surprise some to learn that the team have not had any input into the planning stages of the celebrations. The RAF have a dedicated team planning for the RAF 100 celebrations. In the display office, we have our work cut out managing the many exciting venues I'll be displaying at here and abroad. The RAF100 celebration is really an extra bonus to us. This year's display calendar includes more appearances abroad than previous seasons, was part of this an intention to reciprocate for international displays attending RAF100? We've tried to show off the RAF as best we can, and with RAF100 why wouldn't you? We are very keen to help everyone around Europe by turning up with our display but we can only perform a certain amount of displays a year of which two can be abroad. We have been very fortunate this year that we can increase that slightly with the export campaign for Typhoon and the fact that it is RAF100. Some individuals have expressed disappointment that the Typhoon will not be appearing at their event. An example being the disappointment that the Typhoon won't be appearing at Bournemouth for the second year running. Jim explains that this is all down to the display range of the Typhoon and shows changing their dates. We have quite a large engineering footprint that has to go with the jet and the only way we can do that is to base ourselves at one location for a weekend. We can't split or double-team and we only have a certain range with the jet to then do a display. The reason we are going to Prestwick/Ayr the weekend of Bournemouth is that we are engaging with Scotland and other RAF assets will engage with Bournemouth. We would love to be everywhere all the time but we can't be in two places at once. What happened was Bournemouth changed its date by a week and now clashes with Prestwick so we have to make a decision. It would be nice if the dates split again then there would never be an issue. Returning to RAF100, does Flt Lt Peterson believe the celebrations will live up to the expectations and hype that is out there and what should be the legacy of RAF100? Let's embrace what we have got and be positive rather than negative. We need to celebrate the past but really look to the future and make this the point where the RAF really became a future force. Let's really inspire young people, maybe not necessarily to join the RAF itself but in some way be inspired by the RAF, for example to increase the number of young engineers in the country. Once this season is over, Jim will more than likely manage and mentor the 2019 display pilot to continue a legacy of professional and safe displaying on the Typhoon. However, he has no plans to move on and wants to continue to put his 12 years' experience on the type to good use. Every day I have a smile on my face flying it, why would I put that at risk by going on to something else that might not make me as happy as the Typhoon does? Everyone at UKAR wishes Flt Lt Jim Peterson all the best for the 2018 display season and we look forward to seeing his performance on multiple occasions. Andy would also like to thank Jim and his team for agreeing to be interviewed during their busy workup. If you would like to see Flt Lt Peterson display for yourself, you can find a list of 2018 display dates on the RAF Typhoon Display Team website.